1965: Chris Colt got his start in New England for Promoter Tony Santos under the ring name Maurice “The Magnificent” Chevier. Chris Colt used the names Chuck Dupree and Paul Dupree when he and Ronnie Dupree teamed as “The Commancharos”..
~~~He and Ronnie worked in the Gulf Coast starting in 1967 as “Golden Boy” Ron Dupree & Chuck Dupree..
Jack Dillinger recruited Jim Dillinger (Chris Colt) to reform The Chain Gang in WWA Indianapolis..
~~~This version of the Chain Gang eventually split up and Chuck Harris became known as “Chris Colt”..
Chris Colt had a brief run in England as “The American Dream” but was fired when he was considered unreliable..
1996: Chris Colt passed away (possible from AIDS?) 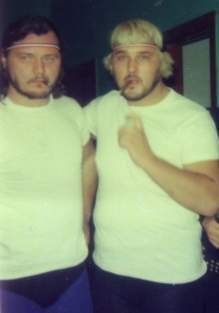 in Washington after a battle with drugs and alcohol addiction..
Jay Ambler wrote: Chris Colt was a bit of a mystery for the wrestling world. As a youth he was a caddy for wrestler Don Fargo. His debut was believed to have been in 1967 in Arizona. 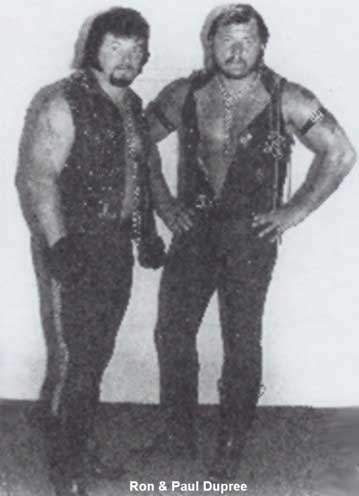 His tagteam partner was Ronnie Dupree and the duo called themselves The Comancheros, which was a biker gang image gimmick. After a blazing run through Arizona and the Gulf States promotion, Dupree and Colt would then go on to hold the Detroit NWA tag belts in 1967 and 1968. In 1974 following a fued between Dupree and Colt the two reunited and captured the Gulf States tag team belts. In October 1975 Dupree suffered a fatal heart attack while doing ring announcing in Tacoma, WA. 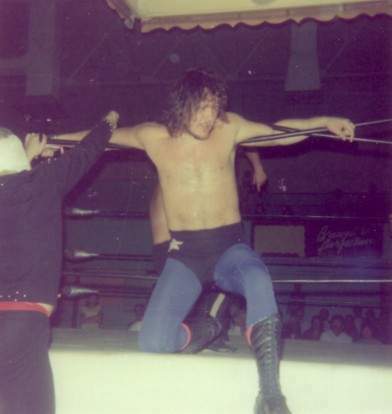 Colt would then later tagged with Lanny Poffo and capture the Detroit tagteam belts in 1976. The remaining 1970s had Colt donning Alice Cooper style makeup. As in the past Colt’s heat was considered second to none by many promoters. While he gave them headaches, his fueding with opponents and fans, which often led to hysteria also meant big money. 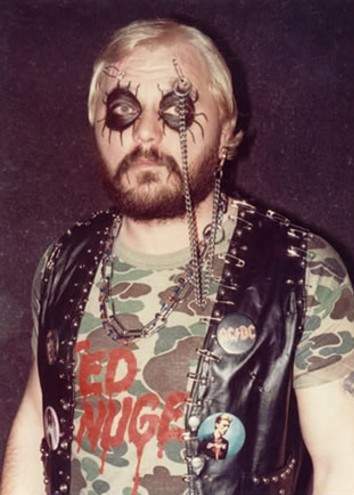 He toured Ontario and finished his career in 1986 in Alabama under the alias Chris Von Colt, a Natzi type German gimmick. He dissapeared from the scene shortly after and later popped up in gay adult films. Colt was openly gay and it was no secret his ring name ‘Colt’ was a take on the ‘male model’ magazine by the same name. Beginning in 1994 Colt was known to be contacting old friends and promoters in the wrestling business. The conversations were often about their past affiliation and by some accounts these conversations were bitter sweet. Colt lived most his life under the influence, another well known secret and it had taken its toll on him. It was also believed he had contracted the AIDS virus. It is believed although never fully confirmed that Colt died at a Washington mission in 1996. (Source: The Heels by Greg Oliver and Steven Johnson, 2007)..
Tom Burke wrote: I read the article by your writer Jay Ambler. Mr. Ambler has some major errors in the article. Chris did not start in the business in 1967 .. it was in 1965 in New England for Promoter Tony Santos under the ring name Maurice “The Magnificent” Chevier. He later went on to the Maritmes in 66 as Don Juan then to Mobile with Ronnie Dupree as Paul Dupree. These are just a few of the errors which I picked up. My assocation with Chris Colt (Chuck Harris) dates back to the year JFK was president. We use to be pen pals when he lived in Washington State and I was in Massachusetts. Being the same age we had a lot in common. Our frienship lasted from those early 60’s till about 6 months before he passed away.